Memphis-based Morgan Jon Fox is still getting comfortable with the label of being the voice of the YouTube generation. Since premiering his third feature, OMG/HaHaHa at NewFest in New York City last June, his low-tech improvised/Web cam/quasi-documentary hybrid of a group of gay, straight and transgender Memphis teens has struck a chord with young festivalgoers as well as critics. The film has taken home Best Feature awards at both the Memphis Indie Fest as well as the Chicago LGBT Film Fest. “I did not think this was a film that anybody would like, to be honest with you,” says Fox, 30. "I thought it would be something that the people involved and people that I had inside jokes with would get. It would be something to watch at parties." A film-school dropout, Fox began making short digital films in 2000. He made his first feature, Blue Citrus Hearts, from a script he wrote in college as a way to come out to his family. Another feature, Away (A)wake, followed, but it didn't find much notice outside of Memphis. OMG (then titled Hearts*Strings) was shot in 2006 as a culmination of the themes he explored with his previous works — teens, new media and sexual awakenings — and it was shot with friends and family in front of and behind the camera. Recently Fox has found a fan in fellow Memphis filmmaker Craig Brewer. The Hustle & Flow director (and 25 New Faces alum) asked Fox to be his a.d. on his Memphis-shot MTV series $5 Cover, and now Fox is developing a series with Brewer focusing on high school life in Memphis. He’s also in post on This Is What Love in Action Looks Like, a documentary about a Memphis teen who sparked a local protest movement when he wrote on his blog about his parents’ decision to send him to Love in Action, a Fundamentalist Christian program that tries to turn gay kids straight. OMG/HaHaHa will be available on DVD through Water Bearer Films in September. 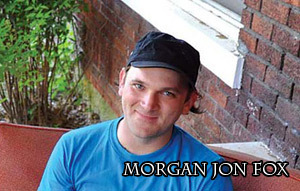 To book Morgan Jon Fox, please contact Lisa Darden at lisa@huptalentandbooking.com or call 240-446-1554.